This is a die-cut Havoline Motor Oil porcelain sign. This particular Havoline Motor Oil sign is shaped and colored like a Havoline Motor Oil can. 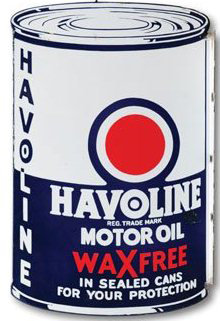 It reads, “Havoline Motor Oil, Wax Free In Sealed Cans For Your Protection” and features a red circle in the middle of a blue and white background.